You are currently browsing the Suburban Homesteading – Frugal Living blog archives for June, 2016. Independence Day is just around the corner, and like me, I’m sure you are looking for a full-proof recipe that will keep you in on the celebrations and OUT of the kitchen. Am I right? My “go to” favorite recipe is slow, simmering pulled pork in the Crock-Pot. It’s a full proof recipe that can’t be messed up. I’m serious, you can’t mess this one up. I dare you to try! It’s also a recipe you’ll love because you can take advantage of all the great sales on pork shoulder roasts during the summer month, or clean out the freezer while waiting for the coming fall harvest. The other reason I love pulled pork is its versatility. Check it out…there is Carolina pulled pork with its vinegary based sauce, or the spicy Louisiana version. But, my all-time favorite is a Texas style chock full of thick gooey sauce. This recipe is simple and economical. It can take a tough cut of meat and turn it into something your family and guests will go crazy over. Plus, using a Crock Pot gives you plenty of time to enjoy the long hectic summer months, what a bonus! And, remember, you can’t mess this up. Cooked more than the recommended time…no problem. Cook it days ahead of a party…no problem. Cook it and freeze for a great winter time treat…no problem. Change the seasonings to fit your family’s taste…absolutely no problem. I wasn’t kidding about being versatile. Even if you want to toss a frozen hunk of meat into the Crock Pot, it’s no problem. I can’t rave enough about adding this recipe to your farmhouse arsenal of full proof, quick and easy recipes. Lay onions on the bottom of pot and place pork roast on top. Mix all other ingredients and pour over roast. Remove meat from the slow cooker and cool on a cutting board until you can handle it without getting burned. This is where things get to be “hands-on”. Pull the meat from the bone and separate the fat. Use two forks, pulling in opposite directions, to shred the meat. NOTE: I have read that some use the paddle attachment on their Kitchen Aid mixer to make this part go faster, but I prefer the fork method because the clean-up is easier. Drain off the fat from the liquid and put the meat back into the slow cooker. Turn on low and let the meat simmer and absorb more of the sauce until it’s ready to serve. After all, it’s all about the sauce…right? Now you’re ready to pile up those buns! Want a few more ideas for your pulled pork? · Use your own favorite BBQ sauce. · Cook the pork shoulder ahead of the gathering then reheat in the slow cooker until it’s warmed through. · Cook up a batch of pulled pork and portion it into freezer containers for quick summer meals. · Pulled pork is the ultimate when piled on a bun and topped with your favorite coleslaw, but if you have family or friends, like me, who are gluten intolerant, skip the bun, it’s great just by itself. · Try something new by dotting your bun with yellow mustard and lying on a nice thick pickle. Cool, crisp, sweet, tart. Your mouth won’t know what to do. · Looking for a pulled pork recipe that’s versatile enough to use in many different dishes? Check out this simple take on an American classic and use it in dishes from salads to nachos; homemade pizzas to southwestern tacos. The possibilities are as endless as the days of summer. There’s just something about having fresh eggs on a kitchen counter that I love. It speaks to my inner farm girl. It shows me how productive my little farm is, and it reminds me to use eggs often (not that using eggs is a problem around here). But, when friends and family visit they always ask me, “shouldn’t your eggs be in the fridge”? The answer to that question is, yes. And, no. 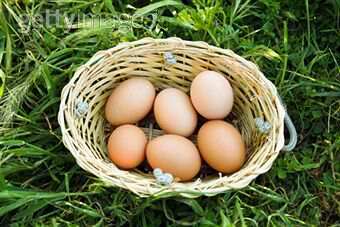 For centuries eggs sat on a counter or table in the kitchen because there was no refrigeration. Just look at any period movie that portrays life in the 1700’s, 1800’s, even the early 1900’s, and I bet if you look closely at the kitchen scenes you’ll see eggs out in the open. Today’s consumer is so afraid of food and how it can be stored that they think every little bit sitting out is a recipe for food poisoning. Believe it or not there are several reasons I keep eggs on the counter. For one, when egg laying season hits full force, and I am overwhelmed with eggs, there just isn’t enough room in the fridge to store them all. Second, my favorite baking recipes call for room temperature eggs, and I like having them at the ready instead of delaying while eggs come to room temp. And, thirdly, eggs don’t have to be refrigerated to keep from spoiling. You heard me right. Eggs DON’T need to be refrigerated, at least not in the short term. I’ll explain when they should in a bit. So—why don’t eggs have to be refrigerated, you ask? One simple, yet little know reason. Hens lay eggs surrounded with a thin, invisible, film called the cuticle or “bloom”. This cuticle film seals the egg, helping to prevent bacteria from entering tiny pores in the shell. The cuticle also helps to prevent the loss of moisture as eggs age. We already knew how wonderful chickens are, but how cool is that? Mother Nature has equipped our hens with a self-sealing mechanism that has enabled eggs to safely stay unrefridgerated for centuries. BUT—and there’s usually a but, isn’t there? This does not apply to all eggs. Commercially produced eggs must be washed before they are sold to the public to meet USDA requirements. Washing removes the thin film making eggs more susceptible to contamination. Without the protective cuticle film, eggs must be refrigerated or else they will spoil. For the home egg producer, however, the question now becomes, to wash or not to wash? Personally, I don’t wash my eggs and never have, until I am ready to use them. For decades, I have left duck, goose and chicken eggs on the counter to be easily used throughout the week. There is one exception though. If I get an extremely dirty or poopy egg it is washed right away and put in the fridge. Who wants THAT stuff hanging around your kitchen workspace? Also, if I get more eggs than I can use in a week or so they go into the fridge unwashed. Eggs can be stored out of the fridge for about a week and a half. If you don’t think you’ll be using them in that time pop um into the fridge. So—how do I store eggs on the counter? That’s the fun part. As I said before, I love having eggs on the counter, those subtle hues of green, blue, tan and almost pink make such an inviting picture. 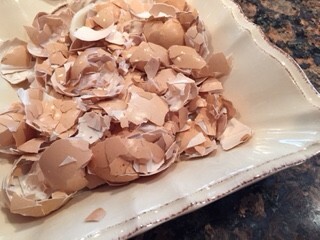 But, what I love even more are eggs in a pretty container. Sometimes I just leave them in my vintage wire collection basket, while other times they are neatly arranged in a colorful ceramic bowl or in a vintage egg crate. I love switching up my containers to create a new look. For longer term storage, the fridge is still your best bet. But, for everyday use let your imagination run wild and create your own farm girl vignette. You’ll enjoy the view.